NOTE: I recommend reading my updated post about how to water orchids. Phalaenopsis orchids are the most readily available orchids and tend to be an orchid newbie’s first; however, many of these beauties don’t come with instructions. Proper watering is key to maintaining a healthy and happy orchid plant, so I’m here to offer up some advice on how to water a Phalaenopsis orchid. First, let me explain the issues with improper watering. When an orchid is over-watered its roots will rot, which prevents the orchid from absorbing water and nutrients; as a result, the plant will die a lot sooner than you’d like. Conversely, under-watering dehydrates the plant and slows its growth, meaning the plant won’t offer up as many of those beautiful blooms. And the blooms are why we buy orchids, right?! 1. Take a look at the roots. What color are they? Dry Phalaenopsis roots are whitish or silvery in color (see top roots in image to the right); moist roots are green (see bottom roots in image). And remember: brown/mushy roots are bad. Aerial roots – those that you can see sticking out of the top of the pot – dry out more quickly than roots deep inside the pot, so simply looking at those won’t tell you about the whole plant’s moisture level. To deal with this you may want to plant the orchid in a clear plastic pot, which will give you a good view of the interior roots. In the example picture, the orchid does not need to be watered. 2. If you can’t see any of the roots, here’s a good trick: insert a bamboo skewer into the potting medium (trim the skewer down so that it just fits in the pot). When you think it may be time to water, take the skewer out and feel it. Is it damp? Don’t water yet. If it’s dry, it’s watering time. 3. Sometimes you can tell that the orchid needs watering just by picking up the pot. This is especially telling if your plant is in a lightweight plastic pot rather than ceramic or terracotta. If the plant feels light when you pick it up, chances are it has sufficiently dried out and needs more water. The third method is not as foolproof as the first two, but you’ll get a feel for it over time. I tend to use a combination of the three tricks before watering. Now that you’ve figured out WHEN to water your orchid, you need to know HOW. First off, water your orchid in the morning to allow extra moisture to evaporate during the day. The simplest method is to water the orchid directly from the faucet. Just make sure that the water is lukewarm; water that’s too hot or too cold can shock the roots. Thoroughly drench the potting medium, but take care not to get any water in the orchid’s crown (the center point from which the leaves grow), as this can lead to rot. If you do get water in the crown (which I do every time even though I try not to! ), stick a piece of paper towel in there to soak the water up. Then, let the orchid drain. This is important. To prevent root rot, you want to get as much of the standing water out of the pot as possible. And that’s it — the basics of watering a phal. It may seem complicated, but it’s really not so bad once you get the hang of it. Happy watering! To get even more tips on how to care for orchids, I recommend signing up for the free Orchids Made Easy newsletter. You’ll get lots of great advice sent straight to your inbox! Very helpful, succinct and clear. One of the most important factors in keeping orchids would be the right amount of water. 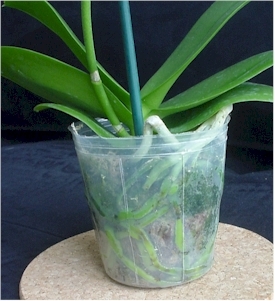 There is actually a great article on watering orchids at OrchidGrowingSource.com. I have had my phalaenopsis orchid for about a year now and it has produced 3 shoots off the side of the main spike. I recently checked out the roots and they are definitely dark, black and i assume rotting. But… there are two new roots growing from it, and it is currently in the process of growing a new side shoot. So i assume it’s still healthy enough? Is there anything I can do for the rotted roots at this point? To be honest, i wasn’t aware that i had to drain the orchid after watering so that may have been the cause. Hi there! It sounds like it’s time for you to take the orchid out of the pot and trim away the rotten roots. After you do this you can repot the plant and it will hopefully continue growing. The fact that it has new roots growing is a good sign that it will survive. Cutting away those bad roots will definitely help extend its lifespan! Once roots have rotted, there’s nothing you can do for them except cut them. Not draining the orchid after watering is one major cause of root rot, so make sure to drain it well after future waterings. Good luck and I hope this advice helps! Hello! I’ve read a lot of your tips and how-tos for orchid growth and would love to have your advice on caring for my current phalaenopsis orchid. I recently received it as a gift in early November, and it now has 15 blooming flowers! It seems like it might have come from the store packed in moss, and because I was scared of over watering so ever since I got it I had been spraying the surface of the media and the roots with Terracycle Orchid Plant Food once a week. I did notice, however, that the surface of the media dried up rather quickly, and I never watered it thoroughly with a faucet because I thought that it would drown my orchid. The orchid had stopped budding a good while ago, and today I was doing a lot of research online about orchid care, and after pulling my orchid out of its pot I think that my media might have been completely dried out. I also can’t tell how extensive its root system is because I’d otherwise have to take the moss away. So I was considering actually watering it tomorrow thoroughly, or should I try to repot it? I know that you said it would be bad to repot the flower when it’s in bloom. I’d really appreciate your advice because I am quite attached to these and really want it to keep living and rebloom in the future. Hi Lin and thanks for your question! You should water the orchid thoroughly once every 7 to 10 days, depending on how much the media has dried out. You don’t want it to go completely dry, but if it is still damp you should wait another day or two. When I say to water thoroughly, that means you should water under the faucet (with lukewarm water). As long as you let the plant drain well, you don’t need to worry about drowning the plant. Which brings me to the question: does the orchid’s pot have drainage holes? If so, that’s great. If not, you’ll definitely want to move the plant to a pot with drainage holes, otherwise you will drown the plant. It’s important for the water to drain out —- problems begin when the plant is sitting in water. As far as the misting goes, it’s good to mist any aerial roots (roots growing outside of the pot, if there are any) every other day or so. I hope that helps — good luck and happy growing! Cool, thank you. I bought an orchid last week and am trying not to kill it. This should help. Best orchid blog I’ve come across. Thanks so much! Thanks for the kind words–much appreciated! Wanted to ask a question. Is it okay for the bottom leaves on a phal to turn yellow? The rest of the leaves are green or dark green. I dont know if im overwatering or under….help! Leaves turning yellow can be normal. Sometimes this just means that the leaf is older and is getting ready to fall off naturally. As long as the rest of your leaves look healthy, I wouldn’t worry. But if all of the leaves start to wrinkle up and go limp, that would be a sign that the plant is dehydrated. I bought a Phalaenopsis about six months ago, growing in bark in a transparent plastic pot. It had four or five flowers on each of two spikes. Unfortunately, both spikes got broken while it was being carried home, and eventually all the flowers dried up and fell off. However, both stems have recently produced new shoots from half way up, now about an inch and a half long. I think I have managed to follow the advice re watering and drainage, and the new shoots suggest that it is basically all right. However, surely it will need feeding some time – what should I use, how much and how often ? And how could I judge when it might need repotting? Have your Phaelenopsis in a bark chip mix in a CLEAR plastic pot with good drainage holes. Pick a day of the week to water it so you remember to water it on the same day every week. Put the pot in a bowl. Run lukewarm tap or bottled water into the pot until it comes halfway up the pot in the bowl. Let it soak for five minutes. DONT FORGET IT! Take it out. Drain it in the dish rack another five minutes. Place in saucer and back in window. The clear plastic allows light to the roots and allows you to see if they are a healthy green. Feed it a weak solution of orchid food (1/4 normal mix ) every week while blooming. Once a month, run water through it to flush out concentrated salts from feeding it. It won’t need repotting until it’s bulging out of the pot with roots everywhere. Hi! I got an orchid as a gift about 10 days ago and have watered it once in that time.. this morning i saw a black spot with fluid dripping out on either stem.. what happened?! It looks like my orchid is bleeding! Any suggestions?? 2 buds have bloomed in this time but im worried the plant is dying. Any advice would be so appreciated! Can you used self watering pots for your orchids and water them from the bottom? I’ve never used self watering pots and I don’t think that most expert orchid growers would recommend them, as there’s too much risk of rot. However, you can water orchids from the bottom by setting them in a dish of water and letting the water soak upward through the pot — but you still need to make sure you let the pot drain really well afterward! Is there a way to tell by the position of the leaves? Like, do they droop when the plant is underwatered? My orchid has its roots covered in thick moss, so I can’t exactly check the color of the roots and go from there. Thanks! Hi Vera, orchid leaves don’t usually start to droop unless they’re incredibly underwatered. Next time you repot your orchid I’d recommend potting it inside a clear plastic pot that will give you a view of the roots and that will help you gauge when to water. If you can stick your finger down into the potting medium a couple inches to feel whether it’s wet or dry that may help too. Happy growing!